I admittedly visit restaurants way too often, and considering that gluten and I aren’t the best of buddies, I find myself constantly hunting for a place that can accommodate my dietary restriction while still being tasty and inviting. When I hear about the newest haunts, I frequently assume that I won't be able to experience them. Considering this, I was surprised when Matt Levin, Adsum's chef/owner, was quick to welcome our Club into his hip, new space. We went during the recent Center City District Restaurant Week, which made for a fairly crowded dining room. 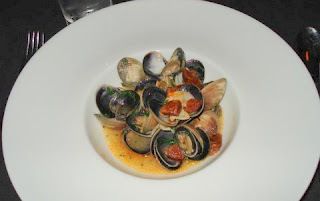 The chef made special arrangements so that we could enjoy a slightly modified prix fixe menu that was free of gluten. Our server, Jack, was quick to explain the menu to us and answer any questions that we had; namely, our curiosity about the Portuguese cockle appetizer. Before long, we were talking and laughing over the first course. I ordered a romaine salad accompanied by roasted onion, polenta croutons and lemon-thyme dressing. The flavor of the dressing was divine, while the soft croutons provided a nice contrast to the crisp lettuce leaves. I also managed a taste of the cockles from one of my friends at the table. With a hint of lemon and a spicy kick from the accompanying chorizo sausage, they made my taste buds dance with happiness. Service of the main course was delayed a bit, but considering the menu was altered and some of the dishes were prepared especially for us, we didn't mind the wait. The majority of the group enjoyed the pork mole with radish salad and lime, and scents of cocoa and chili. 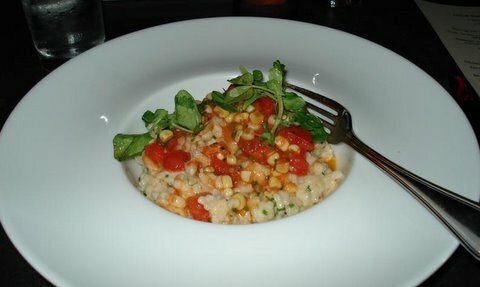 I enjoyed the herb risotto with crunchy sweet corn, tarragon and tomatoes. It was creamy (but not too rich) and cooked to perfection. The dessert course was highly anticipated. Save for some ice creams, it’s not often that a gluten-free diner can safely enjoy a dessert straight off of a restaurant menu. 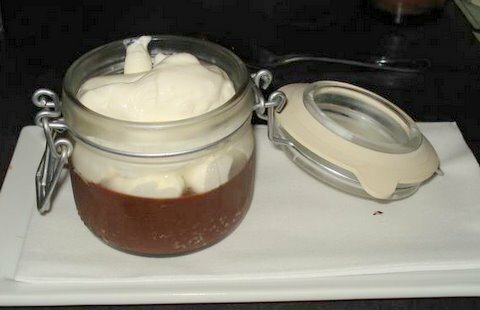 We were thrilled to have a choice of crème brûlée or a Manjari chocolate pot de crème. I went with the latter, and when it came out in a tiny glass pot, I was immediately impressed with the presentation. I was expecting a softer chocolate – almost like a pudding – so I was surprised when I had to force my spoon into a thick layer of chocolate topped with a fluffy cream. The unexpected texture didn’t disappoint, and when the fudgy chocolate hit my palate, I was in heaven. It was so rich, but the whipped cream evened out the intense chocolate flavor. Overall, it was the perfect ending to a delicious meal. The crème brûlée was rumored to be just as delicious by one of our supper clubbers, who also took advantage of the wine pairing through her meal. In the end, our experience at Adsum was stellar. Everyone left full and happy, and was pleased to have been able to enjoy top-notch food from one of Philly’s buzzed-about new restaurants. The conversation was delightful, the food and service were superb, and as individuals with celiac disease or gluten sensitivity, we didn’t once feel as though we were limited or slighted by the offerings. Thank you, Adsum, for a great experience that was unnoticeably gluten free.